Suddenly I don't feel bad about having a muffin for breakfast! FYI...little "r", as well as Emily's two little ones, eat these like candy! Who doesn't love a healthy recipe that kids will gobble up. 1. In a large mixing bowl, combine all the dry ingredients; mix well. 2. Stir in carrots, apples, raisins, and nuts. 3. In a separate bowl combine the milk, beaten eggs and vanilla. 4. Pour the liquid ingredients into the dry ingredients and stir until moistened. Do not over mix. 5. 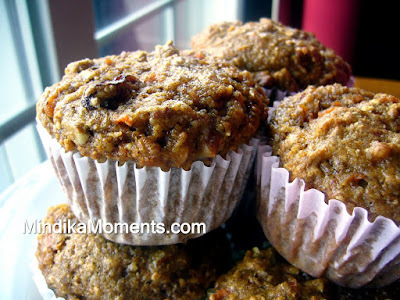 Fill muffin cups ¾ full and bake at 350 degrees for 15-20 minutes.